We got this nice floor fan from Restoration Hardware, the AllAire 16 (a 1/2 price closeout item). Unlike other retro repro made-in-China air-movers I’ve had, the AllAires work really nicely. They’re powerful, yet relatively quiet. If you buy this thing, what you really want to know is how to get the fan on a stick to stand up by itself so you can actually, you know, use it. In other words, how do you attach it to the base? Truth be told, that fucked up diagram and those ridiculous sentences are absolutely useless and have no bearing on what you actually find in the box. So here’s everything they should’ve said, but didn’t. D.5-hole threaded plate held under base weight by the four screws which holds this whole freaking thing together. Be careful with this guy; if you lose it or strip out the holes, you are S.O.L. Step 2: Peel off sticker from center of base weight, revealing recessed screw in center. We truly apologize for hiding this important piece of the puzzle from you; it was mean of us. Anyway, remove short, useless center screw and discard. Remove four remaining outside screws and matching washers, releasing threaded plate. Note which side of threaded plate was facing the base. Retain plate, four outside screws and matching washers. Step 3: Take one of the longer four screws and matching washer from the hardware baggie and insert through center hole of base cover, B. Throw the remaining 7 screws and washers in the hardware baggie away. You won’t need them, they are just there to confuse you. However, you may hold on to them as a keepsake if you really want to. Step 4: Keeping screw pressed into hole, turn over base cover, B. Place center hole of base weight, C, over center screw. Screw threaded plate, facing the way it was before, on to center screw. Screw on barely hand tight—you’ll need to adjust it. Step 7: Slide escutcheon away from base pole flange. Remove four loose outside screws from base cover. Line up flange with four screw holes, re-insert screws through flange and fully tighten, taking care not to overtighten. Slide escutcheon over flange against base. 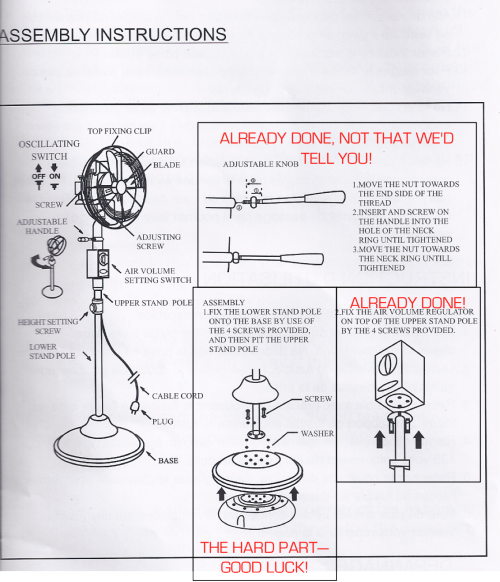 Step 8: Insert fan with pole sticking down from it into base with pole sticking up from it. Step 9: Stay cool, mofo! Jenny found this review of the AllAire 16 on Slate. As noted in this followup post, I get almost no reader emails, with the exception of maybe a dozen grateful responses to this article. And nearly 4 years after first posting it, Restoration Hardware still hasn't improved their assembly instructions.